The Tenjin Festival was held at Osaka Temmangu Shrine on July 24th and the 25th. Some rituals were held at the shrine from late June to July 25th. This festival is said to be one of the three major festivals in Japan , along with the Gion Festival in Kyoto and the Kanda Festival in Tokyo. The Gion Festival attracts many visitors from all over Japan, but I think other two festivals are of not much interest to visitors except local people. The Kanda Festival in May was cancelled due to the Great East Japan Earthquake this year. The shrine worships Sugawara no Michizane(菅原道真) who is known as Tenjin. The festival is said to date from 951 when the shrine priests performed ritual ablutions at a ceremony site where hoko(鉾) drifted after being thrown into the Okawa River in 951. 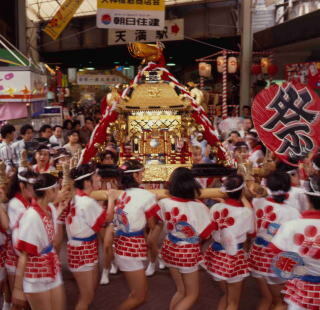 Hokonagashi-shinji(鉾流神事) and Funatogyo(船渡御) come from this ritual. 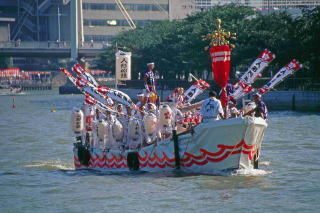 Hokonagashi-shinji is a ritual that hoko is thrown into Dojima River(堂島川) on 24th. Funatogyo is said to have originated as part of the ritual that shrine parishioners went to the ceremony cite by ship to welcome the god. 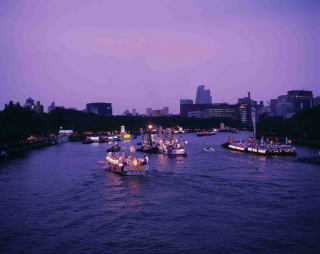 The main events of this festival are Funatogyo and Rikutogyo(陸渡御) on 25th. The sprit of Michizane is moved from the shrine to a palanquin named horen(鳳輦). People in historical costumes carrying the palanquin walk through the town to the boat pier. It's called Rikutogyo. About deccorated 100 boats that they get on sail up and down the Okawa River. It's called Funatogyo. Carriers of this portable shrine are limited to young women.